You forgot to download ID3 renamer	. Click the link below to download it. Every MP3 audio file has an ID3 tag, which can be read by most software media players and even by some media devices. These tags are used to display various information regarding the song, like its name, artist, year, genre and so on. The problem is that some MP3 files, especially the ones downloaded from the Internet, don't have correct ID3 tags or no tags at all. In this situation, you will need a specialized software for reading tags and edit each song separately. This operation can take a lot of time, especially if you are dealing with a large number of MP3 files. But when installing the ID3 renamer application, things become easier. That's because ID3 renamer can rename a large number of MP3 files at the same time, using various rules. Installing the application is one simple task. After launching the program, the user will first need to define the folder location where the MP3 files are stored. After that, one can define some renaming rules. That's because ID3 renamer doesn't only modify the tag information for MP3 files, but can also rename them, for making it easier to spot. After all the rules have been properly defined, the renaming process can begin. ID3 renamer can process large number of files at the same time and offers a very good speed renaming speed. But ID3 renamer also includes some other features. For example, it can generate M3U playlists from the selected MP3 files and can also export the renaming rules and program settings to an XML file, so that one can reuse them later on. It allows you to rename large number of MP3 songs using ID3 tag information. Besides that, the interface and program controls are very intuitive. Furthermore, it can generate M3U playlists from MP3 songs. The application only supports MP3 files. 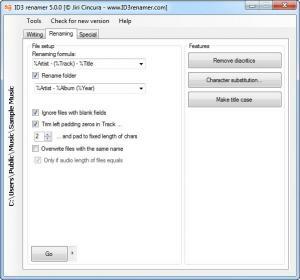 With the help of ID3 renamer, you can easily rename large number of MP3 files using their ID3 tag information. You can download ID3 renamer free here.